Before we make our way to the next dungeon, the Fire Temple, there are some goodies for us to collect. Note that this section is completely optional, so skip ahead to 8.2 to continue onward with the main quest. If you didn’t get this earlier, now’s a good time. In Lake Hylia as a child, there are two Scarecrows between the Lakeside Laboratory and the Fishing Pond. If you play your Ocarina for the one on the lower tier, you can make your own song. Make sure it’s something you’ll remember. Next, come back here in the future and talk to the lower Scarecrow again. Play the song to him to activate the song, allowing you to use it a specific parts of the Overworld. There are certain points in the game where Navi will fly to the middle of nowhere and turn green. These places you can either play the Song of Time to make a Time Block appear, or the Scarecrow’s Song to make Pierre (the other Scarecrow) appear so you can Hookshot to him. There is a Heart Piece that we can collect by the Lakeside Laboratory. It requires you to either have the Scarecrow’s Song or have planted the Magic Bean by the lab. Either one of them will allow you to reach the heart piece. Just outside the Lakeside Laboratory at Lake Hylia, we want to get on top of the building. You can do so by riding the Magic Bean Plant that has grown, or by playing the Scarecrow’s Song and using the Hookshot. Climb the ladder to reach the heart piece. At this point you can return to the Fishing Pond to get more goodies. The water at Lake Hylia is not filled up, so you can’t reach the Fishing Pond by foot. Instead, you can use the Magic Bean Plant or you can play the Scarecrow’s Song. Either way, go ahead and enter the Fishing Point. After paying the man behind the counter 20 Rupees, you’ll be given a fishing pole and can fish for as long as you like. This particular mini-game can easily lead to hours of fun trying to find the biggest catch. Fishing as an Adult is virtually identical as a Child, except the fish are a bit bigger. The largest fish is always right in the center. I highly recommend climbing up and standing on top of the log near the center of the pond. Cast the line and then reel it in. Once the fish grabs hold, I find the best method is to never let go of the A button. Hold down and to the left on the circle pad. Just never release either the A-Button or let go of the Circle Pad. It might take time, but usually Link will be able to capture the fish. If it gets away, you’ll have to leave and come back to try again. It can be frustrating if the Fish get away, but don’t worry, it’s not just you. The other piece of advice I’d give is DON’T SCARE THE FISH! If you do, they will swim to the deepest part of the pond and you won’t be able to catch them. Just keep at it using this method and you’ll eventually catch a big fish. If you catch a fish that is thirteen pounds or more, show it to the man you’ll win the Golden Scale. You can optionally catch the largest Fish at the Pony, the Hylia Loach. It’s totally optional and there is no real reward, but a fun challenge. This particular Fish will not appear everytime you enter the Fishing Pond. You’ll have to enter, pay the man, take a look if the Fish is there, and if not, then leave and try it again. I usually play the Sun’s Song each time to take it to the next day, to give it a better chance for the Fish to appear. Eventually, the giant Hylian Loach will appear, but it is at the very bottom of the pond and cannot be reached. You’ll need to find the Sinking Lure. The Sinking Lure can be found at one of these four locations. It changes each time, but I find that is most often by the narrow stream of water. The Sinking Lure is invisible, so just walk around the area until you are able to find it. The good news is that once you get the Sinking Lure and spot the Hylian Loach, you will definitely be able to catch him, without having to leave the Fishing Pond. It might take a long time, but you’ll get him. With the Sinking Lure, after you cast your line, if you press no buttons, the lure will drop to the bottom of the pond. Unfortunately, it very easily attracts other fish. If another fish catches on the line, just press no buttons until the fish breaks free. You want to drop the Sinking Lure so it is right near the mouth of the Hylian Loach and just let it sit there. The Loach doesn’t move very often, but once it starts moving, there is a chance it might bite at the lure. If it does, immediately press and hold A to start reeling him in. More times than not though, the Loach will just swim away to a different location. Reel in the line and once again toss it so it lands near the Hylian Loach and just wait. Once the Loach bits the line, never let go of the A-Button. From there just hold down-left on the circle pad. The Loach might wiggle around for a long time, but as long as you don’t release the Circle Pad and don’t let go of A, you more than likely will be able to reel in the fish. Just keep at it until you catch the massive fish. If you show it to the Fisherman, he will give you 50 rupees, but says that he will release it back into the wild, due to its rarity. Now that we have the Golden Scale, there are two heart pieces we can collect. One of them is inside the Lakeside Laboratory, and another is in Hyrule FIeld. Inside the Lakeside Laboratory, jump into the small pool of water. Dive down all the way to the bottom of the tank. With the Gold scale, you’ll be able to touch the ground and the scientist takes note of it. Climb out of the pool and talk to the Scientist to get a heart piece. Return to Hyrule Field and make your way over to a lone tree, northwest of Lon Long Ranch. Once you walk over it, the Shard of Agony will start to chime. Drop a bomb to find a secret underground Grotto. Place a bomb near a tree, northwest of Lon Lon Ranch to find a hidden grotto. Underground, jump into the water and dive down below to find a piece of heart at the bottom of the pond. Our next goal is to head back to Goron City. Along the way though, we might as well get some goodies that are now available to us. At the entrance to Dodongo’s Cavern, if you planted a Magic Bean in the soft patch of soil, you can ride the plant up to the ledge and jump off to get a Heart Piece! Now enter the cavern. At the entrance of Dodongo’s Cavern, you can ride the Magic Bean Plant up to get onto the higher ledge where a heart container is located. You could have actually gotten this as a Child with a strategy jump, but this is the intended way to get it. Inside Dodongo’s Cavern, there are two Skulltula Tokens that we couldn’t get when we first made our way through the dungeon. The first one is located in the large staircase room and we could have gotten it after acquiring the Boomerang as a child. I covered it back in Chapter 5, but just in case you missed it, now is a good time to pick it up. 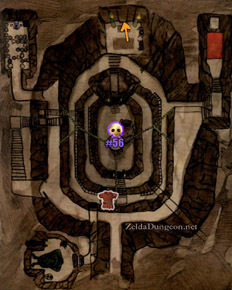 The Gold Skulltula is located in Dodongo’s Cavern, within the room with the massive explodable staircase. However, you’ll have to go the long route to get this one. Ride the tall pillar up to the second floor and head east a room. Drop down below and climb the staircase at the southwest portion of the room before returning to the main room. Cross the large bridge to get back to the room with the Armos statues. Push the statue, climb the staircase, and step on the switch to unlock the door. At last, you’ll be back in the room with the giant staircase. The Skulltula is located at the top of the staircase in a cubby hole. Either go around the left side and climb the vines or jump off so you land on the steps themselves in order to find this hidden area. You’ll need the Boomerang to collect the token as a child, or just use the Hookshot as an adult. The second Gold Skulltula is one that you can only acquire as an Adult. On the first floor of the main room, head through the door on the right side. You’ll find yourself in a skinny room with Baby Dodongos. In the middle of this area along the left wall, Navi will fly up to an alcove and turn green. Play the Scarecrow’s Song to make Pierre appear and Hookshot to him. Snag your fifty fifth token. Re-enter Dodongo’s Cavern and make your way to the room at the southeast part of the main room. This is the room with the Baby Dodongo’s and if you pay close attention, you’ll notice Navi will fly up to a higher ledge and turn green. Play the Scarecrow’s Song to summon Pierre and Hookshot up to find a Gold Skulltula. Our next destination is over at Goron City, so make your way over. There is a Gold Skulltula for us to collect, but it is only available at nighttime, so be sure it’s night before heading into the City. The Skulltula is located on the backside of the center pedestal, located at the top of the City. Once you enter Goron City, walk across the tightropes that are straight ahead. On the backside of the pedestal located at the top of the City, you will find a Gold Skulltula. It’s about time we took care of the ominous cloud hanging over Death Mountain. We can’t actually enter the heart of the mountain yet because it’s so hot. Instead, take a detour to Goron City. Now, you may have noticed that the town is… kinda lonely. There are only two gorons left in the city, and one of them is rolling around on the mid level, just like before. Time your Bombs so that you can blow him up and he’ll yell at you, claiming your name is his own! After a quick chat, you’ll discover he’s the son of Darunia, the Goron chief! He’ll then force you to make him tell two little stories. Turns out, Ganondorf awakened a terrible dragon within the Fire Temple and is going to feed all of the Gorons to the dragon. Poo. After you’ve listened to both tales, he’ll award you with the Goron Tunic. Yay! He’ll open up the shop and Darunia’s room again, and inform you that there’s a secret passage way into the Crater. When you’re ready, go ahead and jump down there, go into Darunia’s Room and pull back the statue to reveal our next destination. Enter the Death Mountain Crate from the secret entrance in Darunia’s Room in Goron City. Use your Hookshot to get across the gap of the broken bridge and walk along the bridge to be interrupted by Sheik, who has come to teach us, yet again, another song. This one is called the Bolero of Fire, and it’ll take you to Death Mountain Crater whenever you like. Nifty as always. I think the song itself is rather boring, but I like the cinematic camera angles on steroids. Oooo. After Sheik is finally gone, we can make our way into the Fire Temple. However, there is a little collecting for us to do here. Play the Prelude of Light to get to the Temple of Time, put the sword back in the Pedestal and go fill up a bottle with bugs. After that, return here using the Bolero of Fire. Use the Bugs on the soft soil next to the Triforce platform to make a Gold Skulltula appear. After slaying it, make sure you plant a Magic Bean. Teleport back to the Temple of Time and return here as an adult. Now you can ride the Magic Bean Plant up to the top of one of those giant volcano-like mountains, one of which has a Heart Piece sitting atop it. Once you have learned the Bolero of Fire, warp to the Death Mountain Crater as a child. Drop some bugs into the soft soil location to get the Skulltula to appear. NOTE: There is another heart piece in the Death Mountain Crater in the cubby across the lava. We got this heart piece as a child by climbing down the wall, but if you didn’t, you can ride the Magic Bean Plant on over to get it as well. Nevertheless, you’ve collected all the goodies, play the Bolero of Fire to quickly get back down to where you need to be. Go straight forward and climb down the ladder to find the entrance to the Fire Temple. As you enter the temple, run up the stairs and enter the door on your left. Just ignore the Fire Keese along the way. Boss Room – Inside, you’ll find Darunia next to the Boss Door. He’ll exclaim greetings and explain what his son already told you, as well as mention that he failed to find the “legendary hammer” and is going to tackle the dragon without it. We already know how that’ll end =( Then he enters without even having the Boss Key. Cheater! After he disappears, you’re free to move around. Jump to the small platforms on your left, then to the little area in the corner. Step on the switch to open the nearby door and speak with the first Goron to free him. You’ll be finding several of them throughout the temple and they all have useful bits of information. This one informs you that you have to “do something” to the pillar in the ceiling of this room. We’ll get to that much later. After he waddles off, be sure to snag the key in the chest, then return to the previous room. Now, go through the locked door on the opposite side. Lava Cavern – This next large room is filled with small islands and floating platforms in the lava. Before we can go through the door across the bridge, we need to get the Small Keys on both sides of the room. Let’s start with the left side (with the Time Block). Work your way over (don’t worry too much about the lava, it hurts you very slowly with the Goron Tunic on) and enter the door you find on the ledge. Inside, release the Goron and snag the key. This one will tell you that walls make different sounds when you smack them with your sword if you can use a Bomb on it. Head back to the previous room. Our next goal is to head across to the other side of the room, but there is an optional Gold Skulltula we can collect right here. Stand at the edge of this platform, turn around, and play the Song of Time to move the Time Block down. This will open up a new door. Climb up and enter it. Tile Room – In this small room, just stay on one side of the room and use your shield to fend off the Tiles that came at you, then kill the Like Like carefully to avoid losing your tunic and shield. I recommend shoot it with arrows. Snag the Skulltula Token and return to the previous room. In the large lava room with the broken bridge, found very early in the dungeon, turn to the left and you’ll find a Song of Time Block on a higher ledge. Stand on the lower platform and play the Song of Time when Navi turns green. Climb up and enter the room here. Defeat the Floor Tiles and Like-Like to find the Gold Skulltula on the back wall. Lava Cavern – Now, make your way to the opposite side of the room, avoiding the Fire Keese along the way. You can walk on lava for short distances without taking damage as well, so use that to your advantage. When you finally get there, you’ll find a funny looking wall in the shape of a door. Smack it with your sword if you’d like to make sure the Goron’s clue is genuine, then enter the door it reveals when bombed. Inside, free the third Goron, who says you can use Bombs to activate switches, then snag the key. Go back to the lava room and go back to the bridge (right side). Enter the locked door to proceed. Flaming Elevator – In this next room, our goal is to get up on top of the metal fencing. You can either slide down the wooden ramp and climb up, or just Hookshot it from here and climb up. Should you fall down into the lava, there’s a ramp on the side, though, you have a tendency to slip, so just wait until the fire hurts you, then use your Hookshot quickly. Once you’ve climbed up, there are two horizontal strips with Keese on them. Kill them and you’ll see that on the right side, there’s a block. Push this over the flaming pit below. Jump on top of the block and wait for the fire to push it up through the roof into a new room. Go through the locked door. Fire Slug Room – In this room, you’ll see a Goron caged up straight ahead. Unfortunately, we can’t get to him from here. Ignore him for now and climb up the ledge on your left. You’ll be confronted by a new enemy: a Torch Slug. These things are very easy, though they’ll relentlessly attack if they see you. Kill it and climb up the next ledge to vanquish his buddy. Across the way, you’ll see a crystal switch next to a block. Jump to it and push the block off the ledge. Next, jump down and pull the block as far as you can until it’s completely covering the symbol on the floor. Climb on top of the block and use it to reach the higher tiers of the platform. At the very top is another piece of fencing that you can climb up, but it’s surrounded by fire. The crystal switch you saw below stops the fire for a short amount of time, but not long enough to climb all the way up. The solution is to stand on the middle tier and drop a bomb on the switch. Climb back up to the top of the platform while the bomb explodes below, giving you plenty of time to climb up the new area and enter the door. This crescent shaped room is filled with boulders that follow set paths that don’t always make logical sense, such as suddenly stopping and going back the other way without hitting a wall. All of the goodies in this room are along the outside wall, beneath overhangs of the ceiling, which makes them easy to pick out. There are two small keys for us to collect. Start off by making your way to the right right, following the outer wall. Keep following the outer wall and you’ll find a floor switch. Step on it and you’ll come across the fourth Goron who informs you about the Door Mimics ahead which can be killed using a Bomb. Snag the Small Key from the treasure chest. Head back along the outer wall again, and you’ll pass the face on the wall where you started. Keep walking around the outer portion of the room and you will come to a small alcove where the ceiling covers it in a triangle shape. Although the wall looks normal straight ahead, if you slash it with your sword, it’ll make a “zipt” sound. That and the fact that you can hear a Gold Skulltula behind it… Bomb it and claim the token. In the boulder maze room of the Fire Temple, there is a bombable wall near the northeast portion of the room. You can slash your sword against the wall and the false sound of the wall will indicate it can be bombed. Drop a bomb and defeat the Skulltula. Next, follow the wall again, making two rights and you’ll find another door which leads to a small, dark corridor again. Release the Goron and snag the Small Key. This one informs you that you can slash your sword or roll if you catch on fire to make it stop. Nifty. We’re done in this room for now. Continue to follow the outer wall in a counter-clockwise direction and you’ll quickly find a locked door just waiting for you to go through. Narrow Bridge And Map Room – In this small room, watch your step so you don’t fall down! This will take you all the way back to the lava cavern with the broken bridge… Shoot the silver eye switch above to open the door on your right. Enter it and open the large chest to find the Dungeon Map. Return to the small room and this time enter the locked door. A wall of flame will abruptly appear behind you and slowly come towards you. If it hits you, it will knock you over and start back a little ways, giving you a chance to get on your feet. Perhaps the main annoyance of this part is the two Red Bubbles, who pop out of the lava in the “convenient” places to jump across. Don’t feel too bad about falling in the lava, as it doesn’t hurt you immediately. You can actually intentionally jump in to avoid the Red Bubbles and walk a little ways only to jump back onto the metal grating. Anyway, just follow it all the way to the end, climb up and go through the door. Boulder Maze (Above) – Now that we’re on the upper half of the room, you can jump from platform to platform to get to other goodies. Straight ahead there is a platform with a Torch Slug. Defeat it and Navi will yell at you about hearing a Goron down below. If you look closely, there is a crack in the ground. Drop a bomb to blast open a hole and climb down the grating. The lengthy hallway will twist around and take you back to the green room we tackled earlier. Step on the switch here to open another prison cell and make a massive shortcut! Yippee! Speak with the Goron, who informs you to use Bombs against the Flare Dancer we’ll encounter later on. With that in mind, snag the key and head back up the metal grating to the upper level of the Boulder Maze. If you look around the room, there is nearby platform with a switch on it. You want to make your way over. However, you’ll have to make a “U turn” of sorts from platform to platform to get to it. First jump to the narrow platforms and make your way around. When it’s activated, it’ll open a cage prison cell up high on the other side of the room. Work your way over there and shoot the Torch Slug on the small platform with your Hookshot to stun it so you can get over there without risk of falling down and losing progress. Jump across, kill it, jump to the Goron. This one tells you to play your Ocarina when you can’t get to a certain place on the map. We’ll get to that in a moment. Anyway, the Goron will then walk on mid-air in escape. I wish I could do that… Snag the small key and head back to the middle of the room. NOTE: At this point you can progress onward in the main dungeon. We want to make our way back to the room with the wall of fire that was following you. However, there are some extra goodies for us to collect here. There are a few secret rooms that you can get to using the hint that the Goron told you. First, go to the entrance to the Boulder Maze room on this higher level, right near that first Torch Slug and the secret hole in the ground. While standing next to the door and facing the room, if you turn right you’ll see a platform above you which Navi flies to. Play the Scarecrow’s Song to make Pierre appear. Hookshot to him, then turn around and Hookshot to the small elevator platform which takes you up. Go through the door. Secret Room 1 – Round the corner and climb up to find a Gold Skulltula. Snag it’s token and climb up to the next door. In the boulder maze room of the Fire Temple, once you are on the higher level after passing through the room where the fire is chasing you, turn to the right and play the Scarecrow’s Song. Hookshot to Pierre and then Hookshot to the secret elevator. Go through the door and climb the grate to find the Skulltula. Secret Room 2 – In this final secret room, go forward a little ways and immediately turn left. You’ll quickly see yet another Gold Skulltula on the wall. Use your Hookshot to retrieve the token. After using the Scarecrow’s Song and riding the secret elevator, climb up to the large open room. Walk close to the edge and turn to the left to find a Skulltula on the wall. Now, there’s a switch nearby that douses the flames surrounding the chest on the ledge above. It only contains a gold Rupee (200). It’s not really worth it, but should you seek the challenge, you have to Hookshot to the target atop the steep ledge, then run the rest of the way, cutting it close to the edge. You should barely make it. To get back, simply jump into the center of the pit, then let yourself fall all the way down. You’ll land in the center of the small, circular room with the narrow bridges. Go through the door to reach the room with the Flaming Wall once again. Flaming Wall of Death… Room… – Whether you did the last section or not, our next objective is to get to the next locked door. You should have two Small Keys at the moment. Get to the room with the flames that appear behind you and force you to run onward. Halfway through the room, there is a ledge with a locked door along the outer wall. Get to a high point of metal grating and jump to it. Go through the door. Go through the next small hallway. This large room is shaped like a big “C” and has many skinny pillars sticking out of the ground, between which are invisible fire walls that you can only see when you get close. It’s fairly annoying, especially once you get to the rolling boulders. Also, there are fake doors in this room that will fall on you if you try to open them. You can tell if they are by the way they kind of stick out from the wall rather than being indented into it. A Bomb will easily dispose of them. So, all that being said, make your way right, staying close to the outer wall. Kill the Fire Keese that come after you and avoid the boulder. You’ll see a door ahead on the right, but watch out for the fire in the pillars right before it. You’ll have to walk around it. The small room simply has a large chest containing the Compass. Ya, that’s all we came this way for. Go back out and this time work your way back to the left side of the room. Don’t be fooled by the “door” across the way, that one’s fake. After you pass by the giant pillar and the two spinning faces that shoot fire, you’ll find yourself amidst another maze of invisible fire walls. There’s a trapped Goron in this room, but we can’t do anything about it at the moment. You can play your Song of Time at the spot where Navi turns green to make a Time Block from the ledge above come down and give you a shortcut to the upper level, but it’s not really important right now. Go ahead and go through the next door. We’re back on the other side, past the invisible wall of fire. Watch out for the Fire Keese that wants to burn your nice red hat. Now, there’s a door behind a wall of flaming death on your left. To get there, you’ll need to step on the switch across from you. There are some invisible walls blocking the way though, so you’ll have to navigate towards the right a little and sneak around the flaming pillar. Once you step on the switch, the flame will disappear. You have to quickly make your way over before the flames come back. Be careful though, as there are more invisible walls. Set out your path before you press the switch and then quickly run over. Once you’re safely past the “flaming wall of death,” feel free to snag the goodies in the jars nearby. The door in the cubby is in fact another Door Mimic. Use a Bomb on it to reveal a hidden door behind it. Flare Dancer’s Room – Yipes! This mini-boss is known as a Flare Dancer. It’s pretty easy if you know what to do, but can be annoyingly awkward to defeat if you wait too long. As soon as the battle begins, this enemy will jump out of the flames and start spinning. If you don’t stop it quickly, it will shoot out flames in a radius around him. He has two types of flames: red, which simple sits there, and blue, which slowly inch their way around the room. The rest of the time, he’ll zip around the room like he’s skating on ice, leaving a trail of fire in his wake. He purposely tries to knock you over while doing this, and while it doesn’t do any damage, it makes it annoying to get your bearings again. To hurt him, you have to wait for him to hold still right before he attacks. While he’s spinning around, target him and either throw a Bomb or use your Hookshot to temporarily rid him of his flaming body. He’ll be reduced to a black torso, which grows tiny legs and runs around the room squeaking. He’ll circle the room, then turn around when he sees you and run the other way repeatedly. Eventually, he’ll jump back into the flames. The best way to harm him is to run the opposite direction the he running, and once you collide, he will stop and try to turn around. Nail him with a jump attack and slash away a few times. Once he runs away, turn around and run the opposite direction to repeat the process. Eventually, he’ll take enough damage or be out long enough and jump back into the flames. If you harmed him enough, he’ll change colors, just like the Torch Slugs. He’ll change from Red to Blue to Green. It’s a nice little gauge to see how much life he has left. Overall though, disembodying him with the Hookshot then circling around and using a Jump Attack is by far the easiest and fastest way to defeat him. After he’s dead, the flames on the platform will go out and the door you came through opens back up. Climb atop the platform and it’ll take you up a level. Go through the door. Another Cystal Switch Room – In this next small hallway, climb up the grating along the side, then place a Bomb over the edge to blow up the crystal switch like we did earlier. Climb up and again, enter the door. Hammer Cavern – This massive room is quite difficult as well as annoying. The goal is to step on the switch on the next ledge, then run along the skinny platform up to the giant chest before the fire comes back. The only problem is, if you fall off, you’ll have to work your way back up to this room all over again. Because of this, I recommend you use Farore’s Wind to create a portal at the door, which will allow you to warp back to the top if you fall down. Farore’s Wind is an optional spell, so don’t worry if you don’t have it – it’s not required. First of all, I suggest going a long the left side and work your way all the way up to the chest, killing the Fire Keese along the way. This will make sure they don’t bother you. Jump back down and stand next to the switch. When you’re ready, make a run for it. It may take a few tries, but the prize is worth it, the Megaton Hammer. Jump off to the lowest portion again and use the Megaton Hammer on that small platform on the ground with the Fire Temple’s symbol on it. Jump down through the hole it reveals and use the Hammer to break down the totem-like statue heads blocking a door. Go on through. Run forward, then turn around and kill the Keese before you do anything else. Next, smash the oddly placed pillar with your Hammer. This will cause the floor to break down into giant steps that lead down to a door. Before you go down there however, pickup one of the nearby boxes and go down. If you broke them, just re-enter the room to make them appear again. At the bottom, place the box on top of the switch to keep the door open and go through. Invisible Fire Wall Maze – This next tiny room is pretty obvious. Smash the lone platform (I like to do so while standing on top of it) and it’ll lead back to the giant crescent shaped room we tackled earlier. Climb up onto the platform and you’ll find a rusty switch. You may have admired it earlier. Anyway, smash it with your Hammer and enter the door that has been closed for so long. Time Block Room – In this small room, play the Song of Time to move the Time Block across the way if you haven’t already. This will make another shortcut to get to the upper level as well as reveal a rusty switch across the way. Jump over there and use your Hammer on it to release the Goron below. Jump down and talk with him to learn that there’s a statue in the starting room. Be sure to snag the Small Key before you go. Climb back up the ledge using the Time Block and go through the door. Invisible Fire Wall Maze – The first Goron you saved said that you needed to find a way to make the “pillar in the ceiling” come down. In this main room with all the invisible fire walls, get on top of that giant platform that goes straight through the floor and use your Hammer. Fall through the hole it reveals to be taken all the way back to the room where you first met Darunia. This will make a path to get to the Boss Room! Unfortunately, we don’t have the Boss Key yet… Leave the room. Entrance Room – Now that we’re back in the entrance room, you should be able to quickly find the statue that the Goron from a moment ago was talking about. Go down and stand on either the left or right side and pound away at it repeatedly. Go through the locked door that’s revealed. Torch Slug Hallway This small room is filled with Fire Keese and Torch Slugs. Kill the Fire Keese first with your sword, then use your new Hammer to flip the Torch Slugs harmlessly over, leaving them defenseless. After they’ve all been defeated, go through the door. Second Tile Room This small room has more flying Tiles and a Like Like. Kill them all and snag the Gold Skulltula, then head through the door on the left. In the room just before the second battle with the Flare Dancer, block all the Floor Tiles and defeat the Like-Like. The skulltula is found on the back wall. Boss Key Hallway In this small hallway, smash the rusty switch and speak with the Goron to get a confirmation that it is indeed “Boss Time.” Open the giant chest to get the Boss Key. Leave through the last remaining door. Entrance Room There’s nothing left to do but go tackle the boss. Head to the room where you saw Darunia and you should have the pillar shoved into the lava, making a platform for you to jump across to. If you didn’t do that, it’s up in the giant crescent shaped room with all the invisible fire walls, awaiting you to pound it with your hammer. Anyway, before tackling the boss, if you want a Fairy in a bottle, there’s one on the ledge to the right in a jar. Enter the Boss Room. As you enter the boss room, jump across to the platform onto the main one. You’ll witness a short cutscene where the platform behind you lowers into the lava, leaving you trapped here alone. The flaming pit in the center will rustle and Volvagia will pop out. This worm-like oblong dragon has you trapped on a hexagon shaped platform surrounded by lava. Should you fall in, don’t worry, cause you can climb up the sides and back onto the main platform. Should the need arise, you can actually climb off to the side on purpose to avoid being attacked by any of his moves. All of its attacks are somewhat awkward to avoid and they all do a great deal more damage than the other bosses you’ve faced thus far. Volvagia has three main attacks it cycles through somewhat randomly. The first is flying up to the ceiling and bumping against it, causing flaming rocks to fall down. Generally, they fall where you were standing when he first went up to the ceiling, so going to the opposite side of the arena usually fixes that problem. In either case, run away from shadows. His third attack is to stick his head out and lean over the edge, pausing a moment before breathing fire or smacking you if you’re close enough. This is your chance to teach him a lesson. Each time he does this, run over and smack him in the head with your Hammer. This will stun him and give you the opportunity to slash away with your sword. When Volvagia is flying around the room, shooting fire at you, you can also utilize your Bow and Arrow, hitting him with a few arrows shots will weaken him. You cannot deliver the final blow this way, but you can cause some damage. As he takes more damage, he’ll stall more in his appearance out of the nine lava holes, trying to trick you into running to different ones. It’s pretty easy to keep track of though, simply because he’ll have two in a row that are fake, then the third one is him. The best method is to simply stand near the middle and run towards the last one. Because lava doesn’t hurt you immediately to walk on it now, feel free to walk over the holes themselves. After several hits, it’ll grab it’s head and scream as it goes back into the lava, only to emerge to fly around as it burns from the inside out and it’s skeleton falls to the ground disintegrating. The triumphant music will announce the appearance of the blue teleporting light. Make sure you snag the Heart Container before you go though! You’ll witness a short cutscene in which the area surrounding Death Mountain is cleansed because the dragon is dead. Well that’s nifty. Shortly after you’ll see yourself appearing in the Chamber of Sages along with Darunia, the obvious choice for the Sage of Fire. He laments about how proud he is of you, and that you’ve become “a real man.” He’ll then give you the Fire Medallion. You’ll appear back in Death Mountain Crater on the teleport pad. Now that we have the Hammer, some goodies are available to us nearby. First of all, head left, back across the bridge. You’ll have to use your Hookshot to get back to the other side (just shoot the broken part of the bridge and climb up). Work your way as far left as you can go, you’ll eventually cross a bridge and be amongst three red boulders. Bombs don’t work on these harder ones. Use your Hammer on the two on your right, blocking the entrance. Inside, you’ll find another Fairy Fountain. Stand on the Triforce symbol and play Zelda’s Lullaby to make the Great Fairy of Wisdom appear. This one will enhance your Magic Meter, making it twice as long. Nifty. With that in hand, work your way back to Death Mountain Trail. The fastest way is to simply break the red boulder on your right as soon as you exit the cave and go up through the entrance to Death Mountain Crater. Now that we can break the red boulders all over the place, there are two Gold Skulltulas we can snag here real quick. Assuming you’re at the top of Death Mountain right now, the first one to get is in that valley at the top of the mountain where the flaming boulders rained down on you earlier. Now that Volvagia is dead, it won’t do that. Anyway, play the Sun’s Song to make it night and smash the boulders to find a Gold Skulltula. Located on the Death Mountain Trail, in the area where there were falling boulders as a child. There are three rocks on this trail that you cannot break with bombs. The closest one to the summit has a Gold Skulltula hiding behind it. At nighttime, break the boulder and collect the token. Next, go to the entrance to Goron City. Right next to it is that ledge above Dodongo’s Cavern where you threw the Bomb Flower over to open the entrance in the past. There’s a red boulder here. Once again, there’s a Gold Skulltula beneath it at night. Located on the Death Mountain Trail, near the entrance to Goron City. There is boulder located just above Dodongo’s Cavern and you’ll need the Megaton Hammer to break it. The Skulltula can be found hiding behind it.